1. Plan your week on Sunday. If you wait until Monday morning to plan and schedule your week, it will not take long before you find yourself engulfed in daily business “fires” and adding tasks and meetings before you even finish your planning. Instead, consider planning your week on Sunday evening, when it is quiet and you have the time and space to concentrate. You will sleep better knowing the task is done and you can devote more time to a morning routine that eases you into the week. 2. Create a morning routine. There is plenty of evidence that shows that getting out of bed a few minutes early, rather than snoozing your way through your morning, has tremendous benefits to your mental and physical wellness. If you have a tough time in the mornings, try getting up and taking a quick and brisk walk around your block, which will get your blood flowing and tell your body and mind that it is time to wake. Your email box can be incredibly intimidating on Monday morning, filled with unread emails from the weekend and the previous week, all of which will immediately make you feel like you’re behind. Instead of reading every old email, delete them. Start with newsletters–they are old news anyway–and then find the confidence to purge any email that was not important enough to answer immediately in the first place. Too many emails to really get through? Consider one of the many applications, such as Sanebox, that can help you get your email under control. 4. Connect with a friend. On Monday, take five or 10 minutes to call a good friend or reconnect with an old friend, one with whom you can have a non-business conversation. These conversations often offer perspective to my life and typically end in a smile–and they help two people ease into the week. 5. Take one new personal risk. There is a great deal of benefit to writing out your goals. I like to spend five minutes each day to review my ongoing goals and priorities. On Mondays, however, I make it a point to set one new and aggressive personal goal for the week, such as trying new exercise, reading a book, or learning a new song on the guitar. The point is to provide you motivation during your busy week to pursue an interest that you enjoy outside of work. In addition to making out that extensive weekly to-do list, also take a minute to write down at least five things for which you are grateful. More than likely, they will be the same from week to week–your wonderful family is always a good thing to be happy about–but doing so will put life in perspective and the positive emotions you create could affect your happiness, optimism, and self-esteem. 7. Pay it forward with kindness. We’ve all been there. Do you have a friend or colleague who often talks over you, interrupts, or one ups your stories? Glances away or fails to make the right follow up comments to show interest? 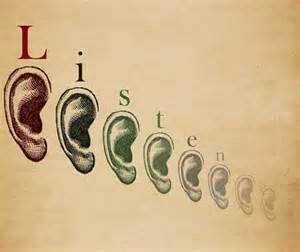 Effective listening makes one feel appreciated, respected and worthy. Poor listening does just the opposite. It’s funny that we tend to pay a great deal of attention to our ability to speak. From Toastmasters to unlimited courses and workshops, we see that speaking, especially public speaking, is a highly desirable, sought-after skill. Public speaking is considered to be an essential ability for those who aim to advance their career in business and politics. But compared to all this attention placed on speaking, listening is virtually ignored. It can be argued that listening is every bit as important as speaking. Everyone wants to be heard and understood, and really that’s how trust and loyalty are gained. 1. Face the speaker and maintain eye contact. 2. Be attentive, but relaxed. 3. Keep an open mind. 4. Listen to the words and try to picture what the speaker is saying. 6. Wait for the speaker to pause to ask clarifying questions. 7. Ask questions only to ensure understanding. 8. Try to feel what the speaker is feeling. 9. Give the speaker regular feedback. 10. Pay attention to what isn’t said—to nonverbal cues. Contact George Alwon at alwon@raleighconsulting.com for additional info. There are many perspectives of what 2012 holds for the Triangle. The prevailing view seems to see some economic growth and improvement in employment. This issue of Small Business Insight of the Triangle contains profiles on the focus, talent and entrepreneurial spirit that define our successful local businesses. Click to read the NEWEST issue of Small Business Insight of the Triangle. The second issue of Small Business Insight is available now, featuring key business owners in the Triangle and five great area restaurants that are perfect for your next business lunch. For updates on SBI of the Triangle visit facebook.com/SBI.Triangle and click on LIKE. As part of RCG’s commitment to community service, George Alwon, Donna Hall and Sarah Van will be facilitators at a two-day program on August 4th and 5th entitled Growing Leaders Seminar, intended for teens ages 13-18. This dynamic, highly participative seminar will focus on skills development in communication, leadership and team building. It will be held at the Lake Johnson Community Center and will include team activities like boating and drumming. We encourage you to consider this program if you have teens aged 13-18 and would appreciate it if you would forward this information to others who might be interested. For more details and contact and registration info: http://9twentyfour.com/growingleaders. We’re excited to announce the premier issue of SBI of the Triangle. Small Business Insight of the Triangle is a new bi-monthly online magazine based on the key concept of being for business owners, written by business owners. Building on the success of Small Business Insight of Hampton Roads, Raleigh Consulting Group is pleased to work with Bill Davis of Team Nimbus NC, to help bring this venture to the Triangle. The magazine will serve as a forum for heightened learning and communication as we capture the voice of small business through featured articles and company profiles. Our first issue highlights 14 Triangle area businesses honored in Inc. Magazine’s 5000 fastest growing companies in America. We hope you’ll take some time to check out the first issue of SBI of the Triangle, and tell us what you think! Follow us on facebook for regular RCG updates as well as useful business tips, videos and articles. RCG’s George Alwon will be a Guest Speaker in this free webinar offered through Vital Learning. The current workforce contains the widest span of generations all working together to meet today’s challenges. It is now more important than ever to match training resources and practices to meet the learning needs of all members of the workforce. The ‘wired’ Millennials generation is pushing the landscape of learning in a variety of ways. This 60-minute Webinar will examine the Learning 2.0 paradigm shift and discuss what organizations can do now to integrate it with current training strategies. Social media is growing … learn how to use it to build a thriving, leading-edge learning community in your organization! This 2-day bi-annual event hosted by Business and Professional Women’s Club of Raleigh (BPW) is an amazing opportunity for you to meet and mingle with women from Wake County and across the state! The event, at which RCG’s Donna Hall will be speaking, promises to help you build skill-sets and make connections.